After you select the wireless network settings for your projector, you can display a QR code on the screen and use it to connect a mobile device using the Epson iProjection app. Note: Make sure you have installed the latest version of Epson iProjection on your device. Visit epson.com/iprojection (U.S.) or epson.ca/iprojection (Canada) for more information. 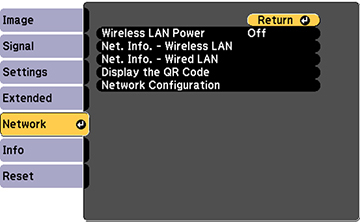 Set the Display LAN Info setting to Text & QR Code. Press the LAN button on the remote control. 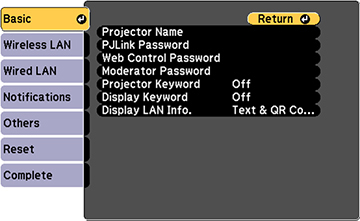 Select Display the QR Code in the projector's Network menu. Your projector displays the QR code on the projection surface. Note: If you do not see the QR code after pressing the LAN button, press Enter ( ) to display it. Start Epson iProjection on your mobile device. Use the QR code reader feature to read the QR code and connect your device to the projector. Visit epson.com/iprojection (U.S.) or epson.ca/iprojection (Canada) for instructions.